← perth day 1: high time to unwind. perth day 2: uptown girl and downtown boy. With barely four hours of sleep in my tank, I staggered out of the Leontes Way abode while Huiyi swaggered out completely refreshed. Ervina very kindly alighted us at South Street, where we had breakfast with Su Ern at the rustic Ootang & Lincoln cafe. Breakfast was exorbitant by any standard despite it being an enjoyable experience for it was wonderful to share a meal with Pastor Meng Cham’s daughter for the first time. We made our way to Perth City after breakfast by train and I think I had one cup (of coffee) too many. By lunch, I had already consumed three shots and that (I reckoned) proved to be my undoing for the second half of the day; I found myself visiting the washroom once every hour. Down Under became an uncomfortable experience down under. As we sauntered through Wellington Street, Murray Street and ultimately to Forrest Avenue where we picked up Liang’s black Mitsubishi Colt at City Towers, fragments of where I’ve visited the last time I was in Perth (in 2007) began to return to me. We put our belongings in the backseat and thanked God for the favour we have received from such generous friends. We strolled to Saint Mary’s Cathedral and spent some moments at the pews, and committed to God this new phase of our courtship. That was a sweet moment that we both enjoyed – God and us in a beautiful place of worship. I couldn’t ask for more. Functional eating meant that we settled lunch at the substandard House of PASTA. We interchanged between the red and yellow CATS (Central Area Transit System) to get from place to place and we eventually ended up at Harbour Town, where the factory outlet stores were located. We were quite proud that we exited City West unscathed – our wallets still looked pretty healthy. Like in Singapore, Tuesdays are also half-priced waffle days at Gelare; the smell of toasted (or baked?) waffles proved too tempting for us and we succumbed; I think I have been eating too much… So thankfully I lost some weight at night with frequent visits to the lavatory. On hindsight I’m glad I proposed to Huiyi in Singapore instead of in Perth. 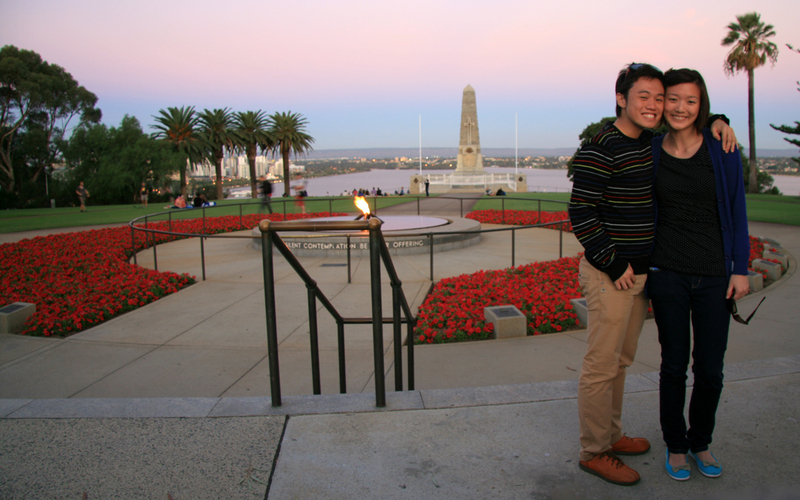 While it was a picturesque moment over sunset at King’s Park, there wasn’t anyone to help us capture that moment. We immediately thanked God for the amazing Gideon and Caleb. They contributed significantly to a wonderful video – we wouldn’t be able to relive that special moment if not for their dedication and commitment to Huiyi and I. Thank you, boys! Giadini served excellent pasta – yes, we had it again for dinner – and I ordered Prawn Ravioli and Angel Hair Agio Olio for Huiyi and I respectively. The portions were huge – so we had enough to takeaway for dinner the next day. We went to the nearby San Churro Chocolateria for our dessert of Spanish Hot Chocolate almost immediately after before driving 25km back home. (I’m secretly proud that our navigation back to Leontes Way was successful on our first attempt!) It was wonderful to spend a little time with the Love Birds when we got back for it gave us a preview of the D&M (Ervina’s self-coined “Deep & Meaningful”) conversations that we were certain to engage in when we embark on our Albany-Denmark road trip on Thursday. P/S: I’ve written this entire entry enroute to The Pinnacles as Huiyi persuaded me to rest early last night. She forbid me from using the computer. I guess there’s a new hierarchy established now, especially when it comes to physical rest, which she’s enjoying now, seated beside me in the 4WD coach. Posted on April 20, 2011, in Extraordinary Mundane and tagged Aw Chin Seng, Caleb Kay, CATS, Central Area Transit System, City Towers, Down Under, Ervina Ng, Ezekiel Varughese, Forrest Avenue, Giadini, Gideon Lim, Harbour Town, House of PASTA, Jemima Varughese, King's Park, Lee Huiyi, Lee Meng Cham, Lee Su Ern, Leederville, Leontes Way, Mark Varughese, Murray Street, Ng Liang Zhi, Ootang & Lincoln, Perth City, Rhema Conference 2010, Saint Mary's Cathedral, San Churro Chocolateria, South Street, The Pinnacles, Wellington Street, Zhou's Kitchen. Bookmark the permalink. 1 Comment.